1. To play with, to joke or to jest at, dally with, to touch lightly upon a subject: When the reporter on TV news alluded to colorful displays, he was talking about the fireworks that take place on the fourth of July in many parts of the U.S.A.
2. To refer to something in a figurative way, to compare symbolically to something else: Kirk told Cathy that he was interested in hearing more about the technology that she alluded to during her presentation. 3. To make an indirect or passing reference to something; to glance at: Charles was alluding to his first wife when he referred to his first love. 4. To hint at indirectly without any specific identification or details, to mention, to refer to: Bill often alluded to his childhood on a farm but he rarely indicated anything specific. The candidate alluded to the recent war by saying, "We’ve all made sacrifices." 5. Etymology: from Middle French alluder; from Latin alludere, "to joke, to jest"; from ad-, "to" and ludere, "to play". Originally "to mock", later, "to make a fanciful reference to." 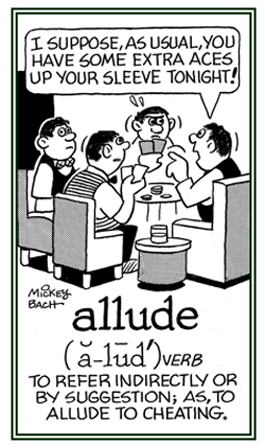 The Oxford English Dictionary says that allude is often used ignorantly as if it were equal to "refer" in its general sense. Go to this allude entry for more information about its meaning.